Although Steve and I got engaged in Bali during Steve’s 40th birthday extravaganza, we decided to wait until we got to Paris to appropriately clad my ring finger. I have always dreamed of a vintage engagement ring–something art deco perhaps–that may have graced the fingers of Zelda Fitzgerald or other dazzling figures from the Jazz Age. Hey, you never know! Our first stop was Dary’s, an elegant Bijouterie specializing in antique and estate jewelry that is snuggled between the likes of Tiffany’s and Cartier on the Rue Saint Honoré. The shop’s prestigious address did not bode well for our budget however, and I tried not to fall in love as I slipped on gorgeous baubles that all topped 5,000 euros. Dainty diamond flowers and cushion cut sapphires danced before my eyes, but a ring from Dary’s was not in the cards for me and my dwindling bank account. 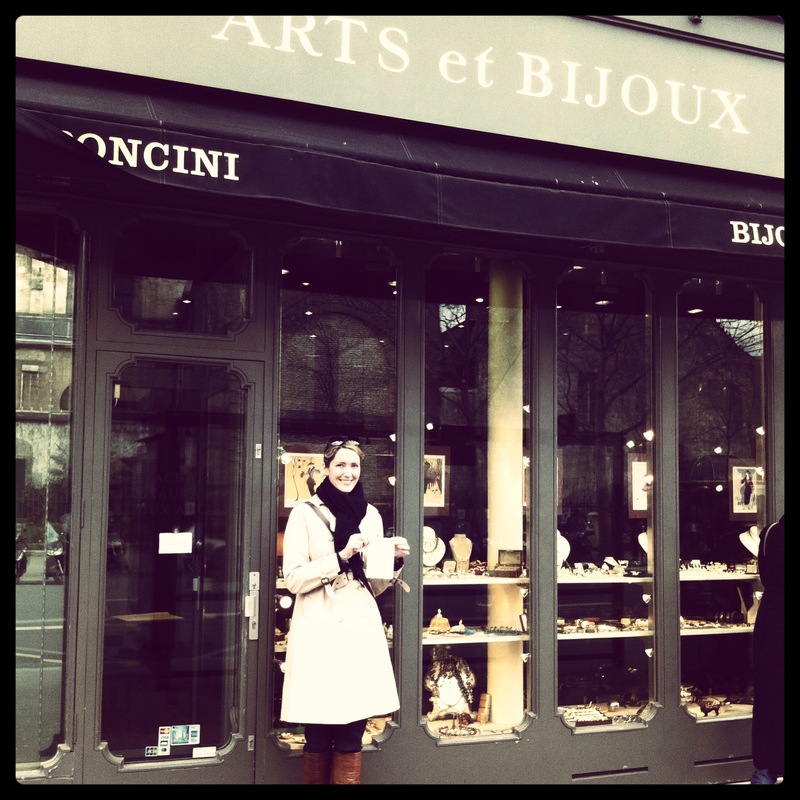 Next stop, a small jewelry boutique on the Île de la Cité that Steve and I stumbled into on my birthday. 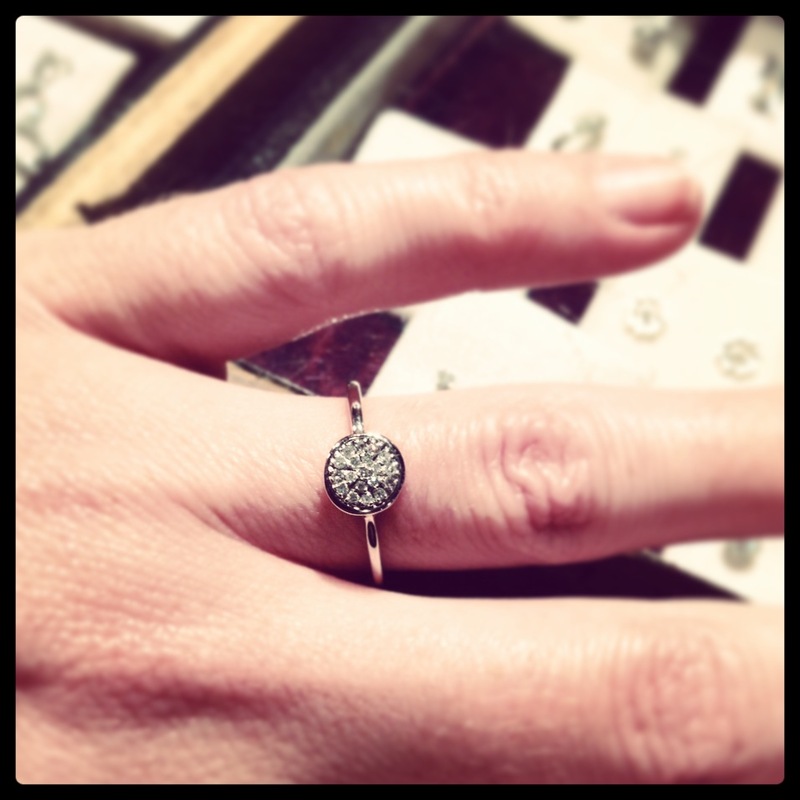 A white gold band topped with a sparkling round pavé setting drew me in. It was under budget and I seriously deliberated making the purchase right there and then. But something stopped me. Although it was a vintage style, it wasn’t actually vintage. And even though I really liked the design, I knew down the road I would regret not following my dream of an antique ring. I became obsessed with Google-ing antique shops and markets in Paris, and we traipsed around the various arrondissements looking for “the one.” Something was always wrong: too expensive, too garish, too costume-y, too cheap. I was beginning to lose hope until one day, we walked out of the Saint-Germain-de-Prés subway station and happened upon Arts et Bijoux, its windows clad with a rainbow of scintillating vintage necklaces, brooches, bracelets, and yes…rings. I hesitantly walked to the window because I was afraid to fall in love with something that was hopelessly over budget–and these rings were so lovely that I expected the rings to run into the thousands. I immediately spotted the ring of my dreams. It looked diamond, it looked platinum, it was an unusual design, and it looked decidedly antique. We rang the bell, and walked into the shop. After pointing out the ring in the window, and placing it on my finger, I knew it was “the one.” The shopkeeper explained to me in charmingly accented English that the ring was indeed diamond, platinum and white gold, and–gasp!–that it was from the 1920s. Fingers mentally crossed, I asked the price. Miraculously, it was 70 euros under my intended budget! I glowed with happiness and excitement, knowing this lovely bit of history would soon be gracing my finger for all time. The avuncular jeweler at this chic little shop sized it for me in half an hour, and from that moment, I was officially significantly other-ed. This post is dedicated to my amazing, wonderful and handsome fiancée. I love you, Steven Moore! I’m so happy you introduced me to your blog! And I’m even happier to read about your adventures with Steve along with way. This ring is beautiful. Everything seems to be just right for you. Congratulations!! Thank you! I’m really happy I ended up with this ring. I love it! Stunning choice Lesley! You don’t see many women opting for classic vintage designs today so i have to say your choice is refreshing! Thank you Juliet. I’ve always loved art deco style, and what better place to shop for it than Paris! It was amazing. I am going engagement ring shopping in Paris soon too and this post is super helpful, I’d have no idea where to begin! Have a wonderful time! The boutique I bought my ring in has sooo many amazing choices, it was hard to choose. But, when you know, you know, and I love my ring. Bonne chance! 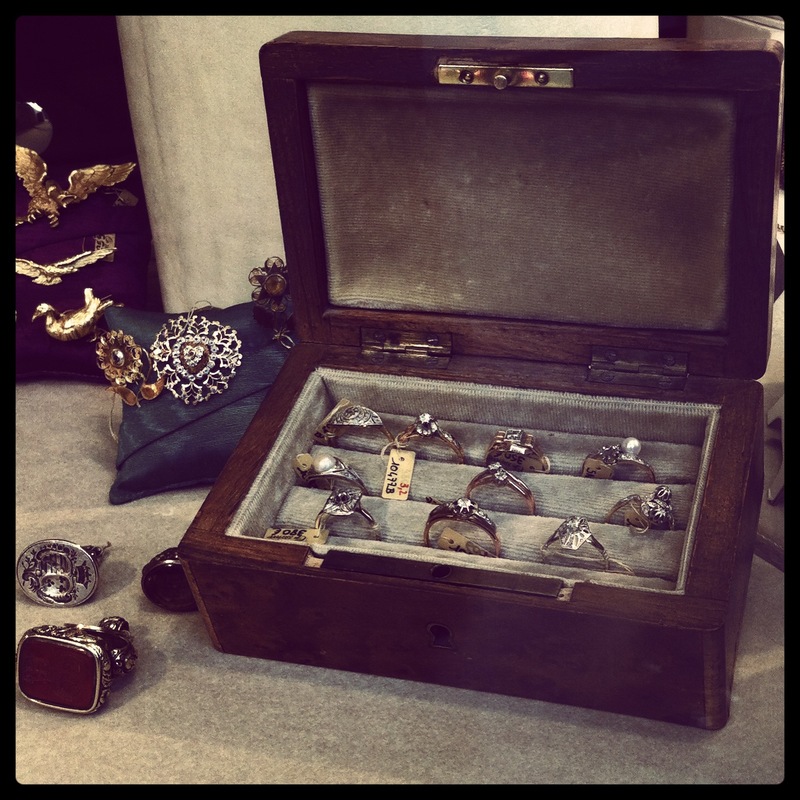 I’m an antique jewelry lover and so when I was planning my France trip I googled Paris antique jewelry shops and came across your blog post. I stopped by Arts et Bijoux today and I wanted everything! I ended up buying a ring that I can see in your third-from-the-last photo =) Thank you for the tip! I got the ring on the right in the second row–every time I wear it it reminds me of Paris, as I’m sure your engagement ring does for you! I love you’re ring it is beautiful! I’m just wondering if you need a large budget for this shop? Thank you Lorraine! I still love it every time I look at it. In my opinion, the prices at this shop are very reasonable. I would say that the rings begin at 200 euros and go up from there. Mine was about 400 euros, which in engagement ring land is not too bad! I hope you get a chance to visit this shop…it’s so lovely. And thanks for following The Chic Adventurer! I’m taking my girlfriend to Paris to do the exact same at Xmas. The ring in the second picture from the top. Is there anyway you could help me track it down? Name of shop, street … Anything? How exciting Mark! The jewelry there is gorgeous and I’m sure your girlfriend will love it. the place is called Arts et Bijoux. Your ring is fabulous!! My fiance and I are going on a ring hunt to Paris / somewhere in France and I came across your blog. Absolutely stellar find!! Congrats to you and your man!! Just wondering, was there a good selection of rings there and did you get it checked to verify it is antique? Or do you just trust the guy? Thanks! Thank you! I do love it. Congratulations to you too! 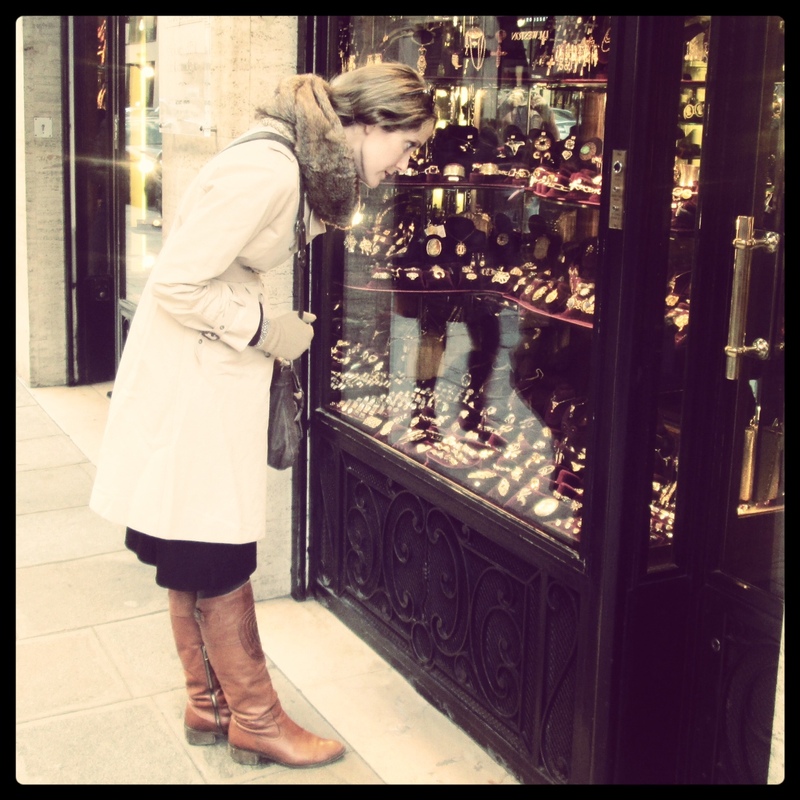 Ring shopping in Paris was such an amazing experience. I loved the one I tried at Dary’s for 5,000 euros, and I was heartbroken because I loved it so much and couldn’t afford it. But then I found the one I ended up with and it was only about 400 euros. So I was thrilled. I didn’t get it checked—it didn’t even cross my mind actually! I just trusted the shop. They do have a good selection…I’d say they had at least 20 or 30 rings when I was there. Good luck with your search! 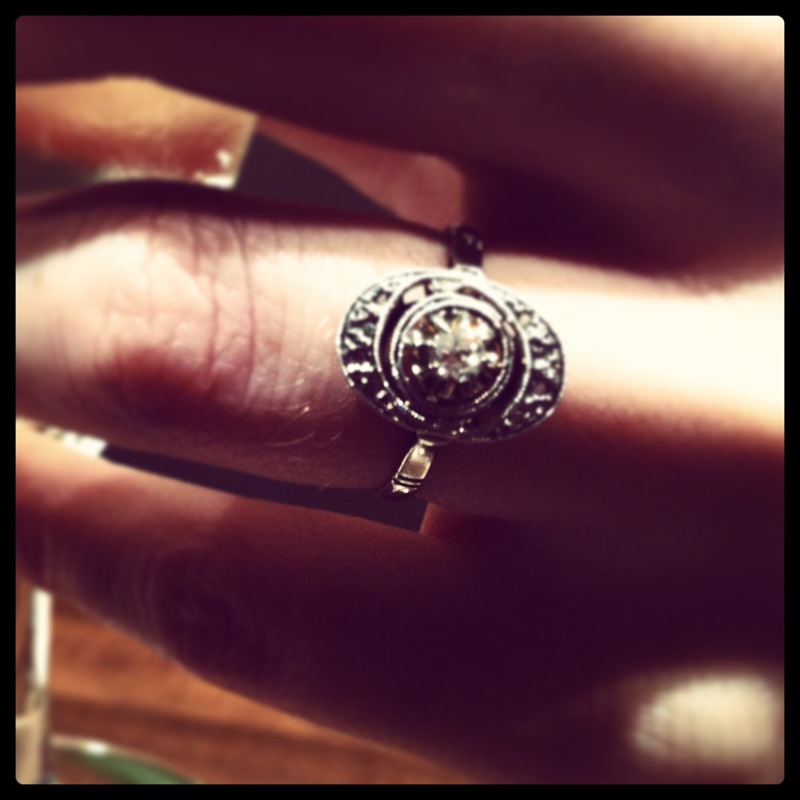 also do you remember where/what the boutique on ile de la cite was for the other ring? it’s gorgeous too! Thank you so much! Arts Et Bijoux was a winner, now have a gorgeous ring on my finger that I can’t stop looking at all thanks to you! That’s fantastic! I’m so curious to see which one you bought. And congratulations on your engagement!